I'll expose my ignorance in writing that until your fine piece I knew nothing at all of S.S. Van Dine. 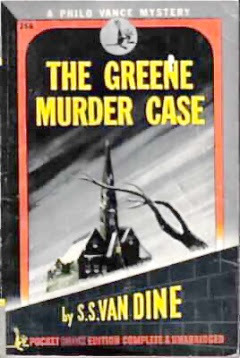 That said, I have a copy of The Greene Murder Case, bought a decade ago for no other reason than it is a photoplay edition. Peppered with floor plans and footnotes, it always seemed such a strange thing, but until now I was never tempted to read it. My thanks for the introduction. Congrats on your excellent review. I recently re-read TH BISHOP MURDER CASE, expecting to find that the enjoyment I remembered from my youthful reading a quarter of a century ago would be dashed - but instead, I liked it better than ever! I think it is only right and proper to point to the limitations of these books, but I think you are right - no matter how unlikely, there is tremendous charm and zest here and a lot of ingenuity. Together with GREENE these are probably the best of the Van Dine books. John Dickson Carr nominated this novel as one of the ten best detective novels ever, along with Ellery Queen's "The Lamp of God" and Rex Stout's "League of Frightened Men." I read it long ago, and as I recall Vance really had to put some overtime and skull sweat into solving the Greene case; no simple, instant deduction here. Did you know that you can create short urls with Shortest and get $$$$ from every click on your short links.